This grand exhibit of 400 Volkswagen automobiles from all over the Mexican Republic is primarily a showcase of the traditional bochos, or Bugs. Held in Guayabitos, the hotel occupation for the event is already at more than 80 percent. 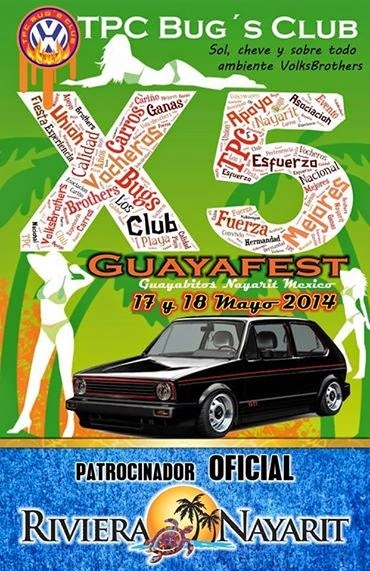 May is a month of intense activity in the Riviera Nayarit and the town of Guayabitos is front and center with an invitation to its 15th annual Guayafest, held on the 17th and 18th of the month. This yearly encounter of Volkswagen vehicles—most of them classics—awaits approximately 400 participants from all over the Mexican Republic and some from the United States. The founder of the TPC Bugs Club, Eduardo Zermeño, said because there are so many participants they will only be holding an exhibit this year. The event starts on Saturday with a parade at 5 p.m. PST through the town of Guayabitos that will end at the main plaza with free music and drinks. Registration opens on Sunday at 8 a.m. PST; the exhibit kicks off at 11 a.m. PST with a four-hour concert offered by Nayarit’s Señor Mezcalito. This event showcases modified automobiles and seeks to conserve the brand and its originality, not to mention the fact that it’s a great excuse to spend a few days on the beaches of the Riviera Nayarit. “This is a family-oriented event and from what we’ve seen in the Guayabitos hotel occupancy we can assume that it’s above 80% so far,” added the founder. All of the registered participants will be given a commemorative trophy celebrating the 15th anniversary of the event so they will be motivated to continue the tradition. “The truth is we’ve had a lot of support from the State Tourism department, the Riviera Nayarit CVB and the Municipal Tourism Office during the past 15 years, as well as help from the hotel association. We’re trying to increase tourism to our beautiful state,” concluded Eduardo Zermeño.